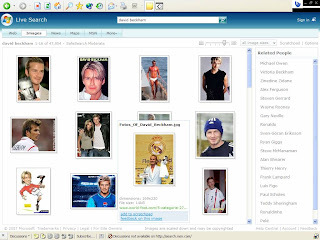 Microsoft have introduced 3 new filters into their Windows image search programme. The filters interpret the nature of a photograph and allow users to make a more refined search. 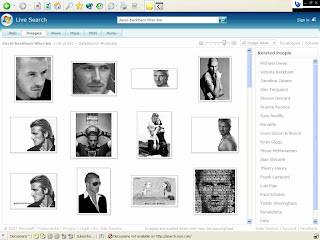 There are 3 filters currently and these are used after the Search subject, eg David Beckham "filter:face", "filter:portrait", "filter:bw" - bw can be combined with either face or portrait. Using one of these filters means that only images that correspond will be served. The image filter is a clever programme as it is able to understand the context of the information it is indexing and can therefore provide better relevancy. One of the first big steps towards Search engines understanding what a user is actually looking for - this is an interesting development. 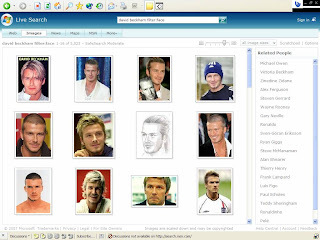 Image searches for David Beckham - no filter, followed by portrait filter, followed by face filter, followed by bw filter.